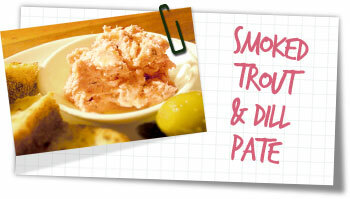 This is the easiest thing to make, and it’s great for a light lunch snack or party dip. I love smoked fish so when I saw a little packet at the supermarket with an “oops! I’m reduced” sticker smacked over it. I snatched it from the shelf as quick as you like. Give this a try – you’ll be amazed how tasty it is. Pick out any small bones from the trout and flake it into a food processor. Add the dill and sour cream and blend into a smooth paste. Stir in the lemon juice, salt and pepper. Cover and keep in the fridge until needed. I served it with toasted breads alongside marinated olives.